History: (Ms. Marvel I#1) - The "WOMAN" idea was born from J.J. Jameson. He decided to create a magazine for females and engaged Carol Danvers as editor. For the first issue the magazine had to speak of Ms. Marvel. Jameson wanted to discredit and accuse Ms. Marvel. (Ms. Marvel I#2) - Carol Danvers and the Woman staff worked on the first issue. (Ms. Marvel I#3) - Carol wanted to write an article about the NASA Skylab project, so she met her old friend Salia Petrie at Cape Canaveral. (Ms. Marvel I#4) - Carol wrote the articole. Sterno and the rest of the staff continued working without Carol. (Ms. Marvel I#5) - Carol inquired into Stark International and how it treated women among the employees. (Ms. Marvel I#6) - The fist issue was printed, speaking of Ms. Marvel, the Sensational Super-Heroine of the 70ies. Jameson wasn't satisfied with the articles, but the first statistics on readers said that "Woman" was the hottest New York magazine of the last 10 years. Frank Gianelli was engaged and went to report about the women in the New York Fire Department. (Ms. Marvel I#8 - BTS) - Tracy Burke was engaged in the "Woman" magazine staff. (Ms. Marvel I#22 (fb)) - "Woman" had budget problems. Jameson was neither satisfied with graphic art nor editorial policy. Carol was missing when Jameson looked for her. (Ms. Marvel I#9) - Carol's absences caused some problems to the editorial office. The meeting for the second issue decided to write about the astronaut women and the Skylab. 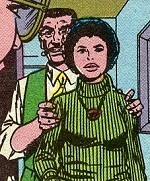 J.J. Jameson engaged Tabitha Townshend for the magazine. (Ms. Marvel I#10) - Again, Carol was missing when needed at "Woman", Tracy Burke tried to substitute for her. (Ms. Marvel I#11) - Another difficult meeting, the staff bickered and Carol was still in late. Months after Carol's visit to Cape Canaveral, the Skylab was ready to be launched. Carol left for Cape Canaveral for her article, Tracy substituted for her. (Ms. Marvel I#13 - BTS) - Weeks passed; other issues of "Woman" were published. (Ms. Marvel I#14 - BTS) - Carol, in Boston, learnt about problems at the yard of the Plumm Project skyscraper then asked Gianelli and Burke to investigate about Maxwell Plumm. They found a lot of material. (Ms. Marvel I#14) - Gianelli and Burke found out that Plumm had seriously gotten into debt and was probably threatened by a gangster named Dominic Varone. That night, Geoffrey Ballard, broke into the "Woman" offices to steal some documents, he was spotted by Gianelli but managed to flee. (Ms. Marvel I#15) - "Woman" received an official visit by Jean DeWolff, Captain of the NYPD, investigating about the intrusion of the burglar. Carol let Gianelli investigate about Ballard. The Magazine continued to have the usual problems with other departments, such as accounting and printing-house. (Ms. Marvel I#17) - After one month, the Ballard inquiry did not produce any fruit. Carol cancelled the task to Gianelli. The management department complained for excess of expenses. Carol let Sharon Cole to investigate for Joe Robertson about some mysterious murders in the New Mexico. In the afternoon Gianelli and Burke led all the staff to the Park to have fun and let Carol distract from the daily problems of the magazine. They organized a very enjoyable snowballs war. (Ms. Marvel I#19) - Ronan the Accuser attacked Carol in her office at "Woman" Magazine, causing several damages. (Ms. Marvel I#20-21) - Sharon Cole disappeared in New Mexico. Carol went there to help her. Ms. Marvel freed Sharon and other humans from the Lizard People, but Sharon could not write the article because her memories were cancelled. (Ms. Marvel I#22) - On November, 13th, (1978 - topical) Jameson fired Carol Danvers. Many Carol's colleague didn't approve Jameson's choice. 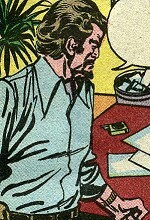 Jameson proposed to Tracy Burke the editor role. Comments: Created by Chris Claremont (writer), John Buscema (pencils), Joe Sinnott (inks). Ms. Marvel fought against the second Steeplejack in the same period that "Ballard" was spying in her life. Is it a coincidence that the name of the first Steeplejack was "Mallard"? Mary Severin's surname was never pronounced. She was an artist and had worked for the House of Ideas. I don't remember other Mary or Marie, pencilers or inkers working for Marvel Comics in those years so it is only an inference of mine that it was meant to be Marie Severin. or any other group or characters with a similar name. (Ms. Marvel I#15) - Alex took care of the administrative problems of the Magazine. He usually had problems with the printing-house and accounts departments. He explained the usual problems to Carol. Gene was "Woman" art director. (Ms. Marvel I#9) - Gene had prepared some pop-art sketches for "Woman's" second issue cover but neither Lou nor Carol liked them and Carol ordered him to prepare a new cover for after lunch. (Ms. Marvel I#10) - Gene, mad at Carol, wanted her to give a look at the new sketches but Carol was missing. Tracy tried to work out the problem but Gene refused. (Ms. Marvel I#15 - BTS) - Gene checked Mary Severin's sketches for the new issues of the Magazine. Jill, as part of the "Woman" staff, participated in the snowball ambush for Carol. Someone hurled a snowball to her, she dodged and the ball hit a Policeman, who, however, smiled and only warned them. Lou was part of the "Woman" editorial staff and was a reporter. (Ms. Marvel I#9) - Lou suggested Rose Carter for the second issue of "Woman" but he didn't like Gene's sketches for the cover. Lynn worked in the "Woman" staff as secretary and archivist. (Ms. Marvel I#6) - Lynn couldn't stop an angered J. Jonah Jameson from gatecrashing Carol's office. Carol fainted for one of her Seventh Sense crisis, Frank Giannelli and Lynn took care of her. (Ms. Marvel I#9 - BTS) - Lynn worked about the Alden Warehouses which connection with AIM had been casually discovered by Ms. Marvel days before. Lynn received was helped by Tabitha Townshend. (Ms. Marvel I#10) - Tracy looked for Carol but Lynn could not find her. (Ms. Marvel I#11) - Lynn warned Carol that the meeting wasn't going so well without her. (Ms. Marvel I#17) - Lynn saw Gianelli in office after a month. Taken by surprise, she was kissed by him and could not stop him from entering in Carol's office. Lynn convened all the staff to discuss about the next issue. (Ms. Marvel I#22) - Lynn was very sorry to hear that Carol had been fired by Jameson. As many other colleagues she was offended by Jameson's action. She sent Carol's things to her house. Mary was one of "Woman" secretaries. (Ms. Marvel I#6) - Mary had been working for the Daily Bugle before "Woman" creation and she also knew Gianelli when he squabbled with Jameson. 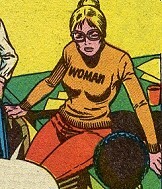 Mary Severin was one of "Woman" artists. (Ms. Marvel I#15) - Mary worked for the "House of Ideas" then changed job and went to work for the Daily Bugle. She worked for the artistic division of "Woman" and her art director was Gene. Her work was appreciated by Tabitha Townshend, very attracted by it. Sterno was probably a reporter. (Ms. Marvel I#4) - Sterno was typing at his desk when Carol returned from her adventure at Cape Canaveral. He passed her a phonecall by Mike Barnett. Tabitha Townshend was a normal girl who didn't like reading so much. 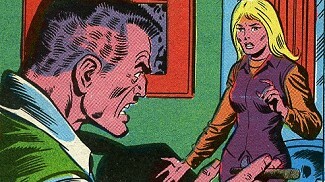 (Ms. Marvel I#9) - Tabitha's father was J.J. Jameson's friend. 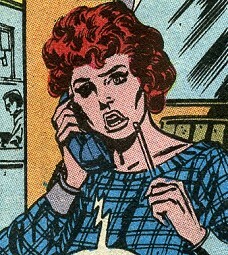 When Jameson heard that Tabitha wanted to work for a Newspaper staff he engaged her as Carol's personal assistant, although Tabitha had not any good attitude to write. 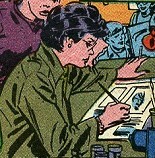 Carol didn't like Jameson's idea; Tracy gave Tabitha the task to help Lynn on the researches about the Alden Warehouses. (Ms. Marvel I#11 - BTS) - Tabitha was present at the staff meeting for the new issue of "Woman". (Ms. Marvel I#15) - Tabitha was curious about Mary Severin's sketches. Tabby's clumsiness scattered chaos and confusion in the office, Carol warned her to stay at her place otherwise she would have fired her, but Tabitha warned Carol that her father would have not liked it.